This limestone cabin is perfect for a weekend at the lake! Nestled amongst a handful of trees down near the lake, this three bedroom, two bath cabin offers a great hideaway for relaxation and rejuvenation. This Indian Lake cabin rental has a beautiful deck that wraps from the garage and main entrance all the way around to the expansive view in the front, perfect for dinners and watching the sunset. Not only is there a deck, but the basement has its own walk out patio leading down to the lake. Inside is an updated, fully equipped kitchen and small dining area. On the main level, the living room spans the width of the cabin with big picture windows lining the entire side. The basement offers additional family room space with sofas and a TV for catching up on shows or decompressing after a day of fun activities. Sleeping arrangements: This Michigan lake retreat offers three private bedrooms and an additional bed in the basement. Two of the bedrooms are equipped with double beds while the third bedroom has a queen. In addition to the three private bedrooms, there is a twin bed in the basement for one more person to sleep. The Indian Lake retreat cabin offers a personal boat dock right on Round Lake. The inland lake is about 216 acres, great for fishing, boating, and other lake activities. The property itself includes a swingset perfect for kids to play and enjoying the outdoors. There is a wide range of activities in the Oscoda area and close to Lake Huron, only about an 18 minute drive from Indian Lake Retreat! 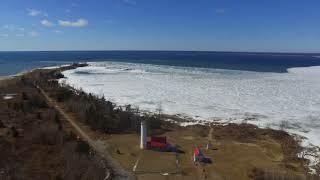 The town of Oscoda has local attractions like Lumberman’s Monument and Largo Springs, as well as the Art on the Beach festival and 4th of July celebrations each year. Being on the river, there are great areas for fishing, along with kayaking and canoeing, and exploring the river area. You can even try out for the AuSable River Canoe Marathon!